A common language and common measure for Kentucky Essential Skills. Press Release: Kentucky workforce and adult ed agencies offer job skills solution. Kentucky Skills U (Adult Education), Kentucky Career Centers (Department of Workforce Investment), Corrections and Kentucky Community and Technical College System (KCTCS) have adopted the WIN Essential Soft Skills Assessment to provide the Kentucky Essential Skills Certificate (KESC) — the first rung in a career ladder of stackable credentials. The KESC, signed by the governor, is being offered through these agencies statewide to enhance workplace readiness and essential soft skills that employers value most. Along with the Kentucky Essential Skills Courseware, a blended classroom learning resource, Kentucky students can successfully master the essential skills and be prepared to earn the Kentucky Essential Skills Certificate. A common language and common measure that employers recognize and value in today's workforce. While professional attitudes and work habits are essential for the 21st century economy, they are often overlooked in educational programs. Kentucky Essential Skills Courseware helps learners develop and demonstrate attitudes and behaviors that are critical to career and life success. Communicating effectively, conveying professionalism, promoting teamwork and collaboration, and thinking critically to solve problems are key components of the Kentucky Essential Skills comprehensive approach to preparing students for success and providing future employers with workplace-ready candidates. Kentucky Essential Skills Courseware uses a blended learning approach that includes classroom, project-based activities and a self-paced, fully narrated online component that provides skills reviews and checks for understanding. A culminating capstone project extends a deeper understanding and mastery of interpersonal skills and work habits. 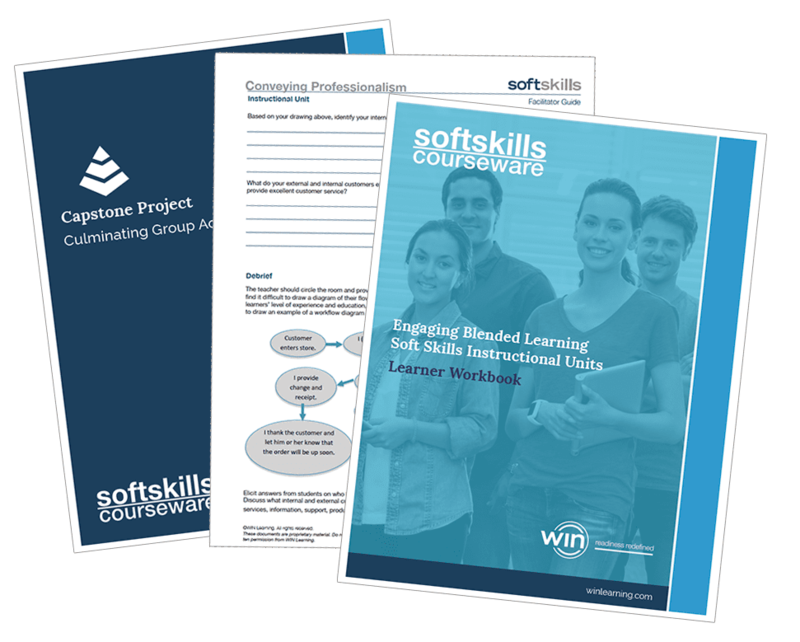 The classroom blended learning materials are designed for learners to work independently or in groups through the four modules. 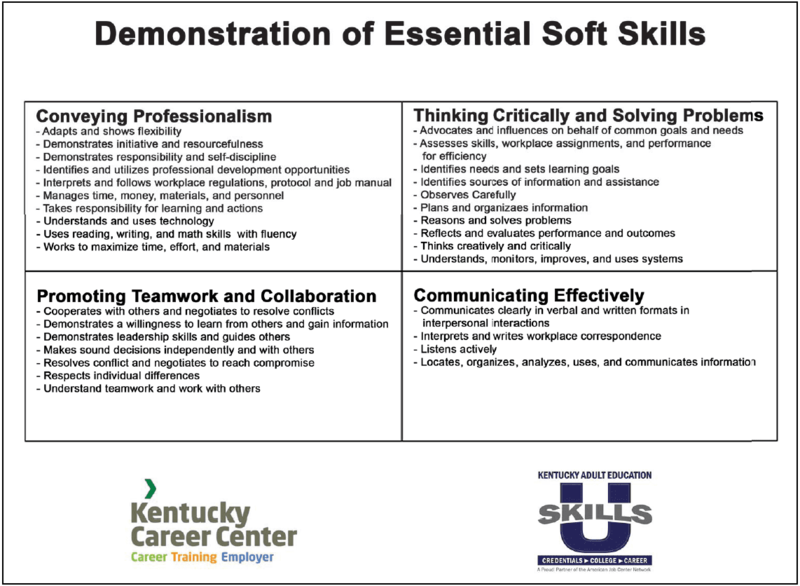 Kentucky Essential Skills Courseware helps learners develop and demonstrate attitudinal and behavioral skills that are essential to success in the workplace and school. These competencies are a key component of Kentucky Essential Skills comprehensive approach to preparing learners for success and providing future employers with workplace-ready candidates. Kentucky Essential Skills Courseware contains 4 modules: Communicating Effectively, Thinking Critically and Solving Problems, Conveying Professionalism, and Promoting Teamwork and Collaboration. The learner receives an eBadge upon mastery of each module which encourages them to continue to earn all 4 eBadges and be awarded a courseware certificate of completion. 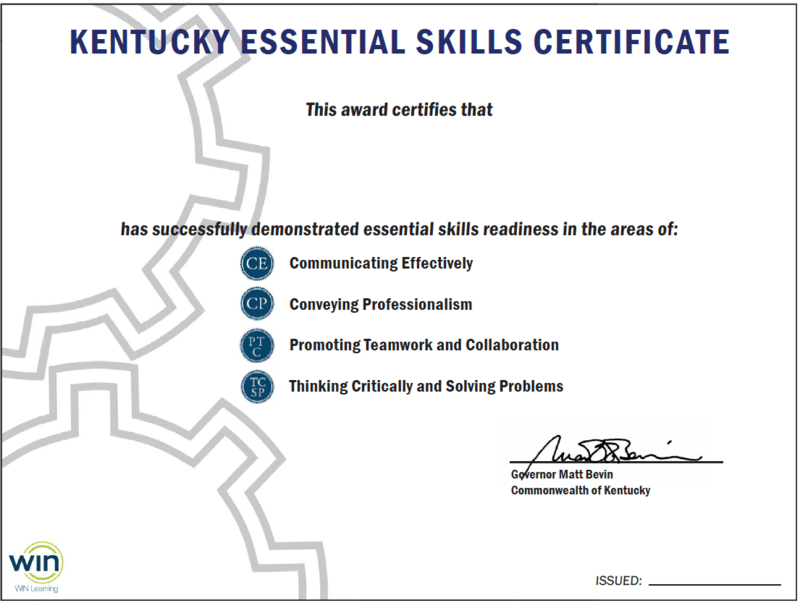 The Kentucky Essential Skills Certificate is earned by successfully completing an assessment that is composed of questions measuring entry-level work tasks and behaviors, including cooperate with others, resolve conflict and negotiate, solve problems and make decisions, observe critically, and take responsibility for learning. The assessment items require the learner to choose two answers for each question, the “best” and “worst” answers for handling each situation. Successfully passing the assessment will earn the Kentucky Essential Skills Certificate. Earning the KESC ensures the job seeker has the attitudinal and work habit skills employers demand. is a validation of the competencies employers value most. We must look to develop a skilled workforce that has both the hard and soft skills necessary to succeed in today's global economy. 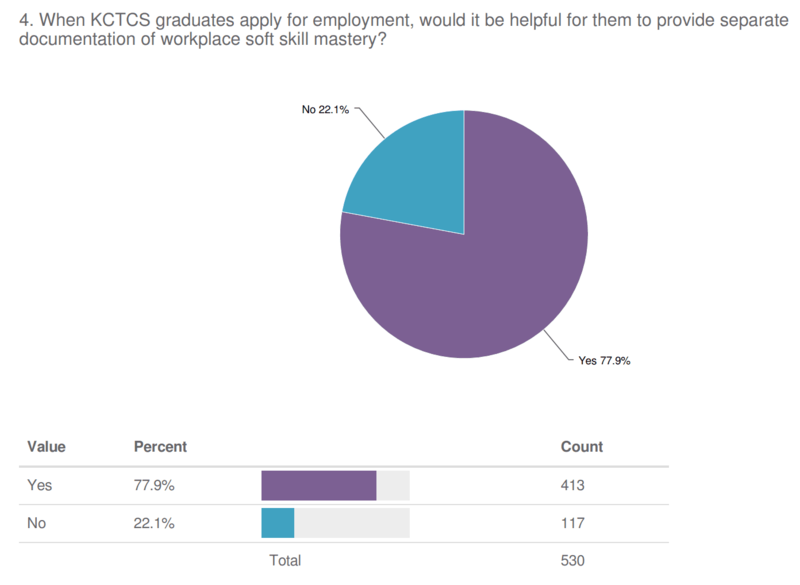 In a recent KCTCS survey of more than 500 Kentucky employers, 78% of those surveyed recommended and valued a separate documentation that demonstrates mastery of essential skills (soft skills). The Kentucky Essential Skills Certificate is the documentation that demonstrates a common language and a common measure across the state of Kentucky that employers value. Download or print a brief overview brochures to share. Kentucky Career Readiness Courseware is ideal for measuring the level of readiness in foundational academic skills that focus on the core communication, reasoning, and problem-solving skills required for 21st Century opportunities from entry level to professional. Career Readiness Courseware provides learners with an initial placement to identify current readiness levels in each of the modules, and to identify further training and education along their career path. Based on their performance, an individual enters the learning module at a level appropriate for their skills and then progresses at their own pace. The Career Readiness Courseware provide learners with a personalized profile of how prepared they are for the Kentucky Career Readiness Certificate. The Kentucky Career Readiness Certificate is a workforce education and development tool, comprised of three proctored assessments, Applied Mathematics, Reading for Information, and Locating Information, leading to a portable credential. It brings employers, learners and job seekers, and education / workforce partners together in building a skilled workforce, while keeping and attracting businesses with higher-wage jobs and economic growth. real-world information, they remain engaged and motivated through graduation and beyond. myStrategic Compass Junior is an online system of career development information, assessments, and activities that help middle school students identify their career interests and answer questions as to what they wand to do and how they can develop a plan to get there. Students create a personal portfolio that transfers to myStrategic Compass for high schools. The student portfolio includes their Course Planner, resume / job application worksheet, and records their career explorations, notes, and interactions. KESC — A common language and common measure. contact WIN Learning at info@winlearning.com or call 888-717-9461. Share your likes or follow us to stay informed about career readiness updates from WIN.